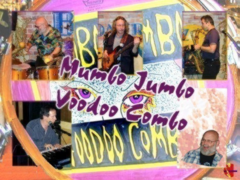 Mumbo Jumbo Voodoo Combo was formed in Ottawa, Canada, July 1991, to explore the pulsating rhythms and eerie melodies of New Orleans and of the bayou’s of rural Louisiana. They have transformed these Mardi Gras anthems into their own, while keeping true to the genre. Over the years, Mumbo has sprinkled their New Orleans Gumbo with ideas and tunes from the lands of Caribbean Seas, Cuba, Venezula, Jamaica and from many other far flung sources as diverse as Desi Arnaz, John Mayall, Osibisa, Ginger Baker, Nat Cole, Ry Cooder, Jan Garbarek, and Manfred Mann just to name a few. During their often segued sets, elements of Blues, Boogie, Jazz, Reggae, Calypso, Mambo and Conga, have led Mumbo to develop into a World-Beat tour de force. The ingredients of the quartette are…4 lead Vocals, Drums, Keys, Bass & Sax. Mumbo has released 3 albums, Walk Thru the Fire, Tools of the Trade & How ’bout That. Their many original songs match their high-powered cover versions of the SECOND LINE FUNK of Dr. John, The Neville Brothers, Sonny Landreth, the CAJUN & ZYDECO of Clifton Chenier, File, Buckwheat Zydeco, the BLUES of Duke Robillard, Smiley Lewis, Dutch Mason and the piano driven R&B of Professor Longhair, Huey “Piano” Smith and Fats Domino.